Stylish and strong, this fabric-wrapped braided cable protects from scuffs and resists tangles. 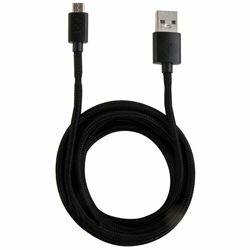 The extra-long 6-foot cable is ideal for charging from the back seat of a car or connecting to a charger plugged into a hard-to-reach outlet. Made for: Android® phones & tablets Galaxy S® phones HTC® phones Digital cameras GPS units Wireless headsets e-book readers Android is a registered trademark of Google Inc. Galaxy S® is a registered trademark of Samsung Electronics Col. Ltd. HTC® is a registered trademark of HTC Corporation. The Android robot is reproduced of modified from work created and shared by Google and used according to terms described in the Creative Commons 3.0 Attribution License.